In clinical practice, the differentiation of glaucomatous from non-glaucomatous cupping can be difficult, even for experienced observers. The purpose of this study was to evaluate the role of optical coherence tomography (OCT) in differentiating glaucomatous from non-glaucomatous optic nerve cupping in a cross-sectional pilot study. Eleven consecutive patients presenting to the Duke Eye Center from September 2007 to July 2008 with non-glaucomatous optic nerve cupping and 12 patients with glaucomatous optic nerve cupping were identified. All patients underwent Stratus® OCT imaging: fast macular map, fast retinal nerve fiber layer (RNFL) 3.4 thickness, and fast optic disc protocols. Automated visual field perimetry was performed on the date of OCT scan in non-glaucomatous cupping patients, and from 0-9 months of scan date in glaucoma patients. Eyes were matched by optic nerve cup-to-disc area ratio; average and mean deviation were calculated for each variable. For a similar average RNFL, patients with non-glaucomatous optic nerve cupping had lower nasal and temporal RNFL thickness, as well as lower macular thickness and volume compared to patients with glaucomatous optic nerve cupping. OCT appears to be a useful technology in differentiating glaucomatous from non-glaucomatous optic nerve cupping. The pattern of RNFL loss appears more diffuse in non-glaucomatous optic nerve cupping compared to glaucomatous optic nerve cupping. Future studies with larger sample size and specific neuro-ophthalmic causes of optic nerve cupping may further elucidate the role of OCT in this clinical setting. Keywords: Optic nerve cupping, non-glaucomatous optic nerve cupping, OCT.
Pathologic cupping of the optic nerve is most commonly associated with glaucomatous optic neuropathy. The cause of optic nerve cupping in glaucoma has been studied histopathologically, suggesting that cup enlargement is the result of nerve fiber loss in conjunction with altered structural integrity of the lamina cribrosa [1-4]. However, other types of optic neuropathies have been reported to cause cupping of the optic nerve, mimicking that found in glaucoma such as arteritic anterior ischemic optic neuropathy (A-AION) [5-9], non-arteritic anterior ischemic optic neuropathy (NA-AION) [5,9], posterior ischemic optic neuropathy (PION) , intracranial tumors [11,12], optic neuritis , dominant optic atrophy , methanol toxicity [15,16], shock optic neuropathy [17,18], and Leber hereditary optic neuropathy . Clinically, clues such as optic nerve head pallor can be useful in discerning glaucomatous from non-glaucomatous optic nerve cupping. However, the identification of optic nerve pallor is often variable and dependent upon clinical experience. In practice, the differentiation of glaucomatous from non-glaucomatous cupping can be difficult even for experienced observers. Trobe et al. [20,21] showed in a study involving reviewing photographs of patients with glaucoma and a mixed etiology of non-glaucomatous optic nerve cupping that experienced observers often misdiagnosed the etiology of the cupping and overestimated optic nerve pallor. Optical coherence tomography (OCT) is an imaging modality that employs near-infrared light to create cross-sectional images of the retina and optic nerve, thereby allowing analysis of the optic nerve head, macula, and retinal nerve fiber layer (RNFL). It is a non-invasive and rapidly obtained imaging test. OCT has been studied widely to evaluate macular and RNFL changes in glaucoma [22-26]. OCT has been shown to have good reproducibility of RNFL thickness measures, suggesting it may be a useful clinical tool to monitor glaucomatous disease progression . More recently OCT has been applied to evaluate eye diseases associated with neuro-ophthalmic conditions such as multiple sclerosis, optic neuritis, NA-AION, band atrophy, and traumatic optic neuropathy [13, 28-32]. Furthermore, specific to NA-AION and optic neuritis, recent studies have shown that OCT can be used to track RNFL loss over time and can be correlated with visual dysfunction [32-35]. The purpose of the present pilot study was to evaluate the potential role of OCT in differentiating glaucomatous from non-glaucomatous optic nerve cupping. The study protocol was approved by the institutional review board at Duke University School of Medicine. All patients were prospectively enrolled at the Duke Eye Center from September 2007 to July 2008. Eleven consecutive patients presenting to the neuro-ophthalmology service with documented optic nerve head cupping, as determined by a fellowship trained neuro-ophthalmologist (MTB), from an etiology other than glaucoma, were included in this study. All patients had a complete neuro-ophthalmic examination and Humphrey visual field (HVF, Carl Zeiss, Dublin, CA) 24-2 testing on the same date as the OCT scan. Neuro-imaging (cranial and orbital magnetic resonance imaging (MRI) with contrast) was obtained or reviewed in all of these patients. Twelve patients with glaucoma, defined by glaucomatous optic nerve cupping (increase in vertical cup-to-disc ratio) and characteristic visual field defects regardless of intraocular pressure, were identified consecutively by a fellowship trained glaucoma specialist (SFF, SGA). HVF 24-2 testing had been performed between 0 and 9 months prior to the date of enrollment. A glaucomatous visual field defect was defined as one in which there was at least clustering of three contiguous test points and a pattern standard deviation with a probability value of <5%. Standard clinical examination for all patients included: visual acuity (Snellen visual acuity chart), color vision (Ishihara pseudochromatic plates), pupil examination, tonometry, slit-lamp examination, HVF (24-2 SITA standard program), and dilated fundus examination. The following was abstracted from the medical chart for all patients: age, race, refractive error, optic nerve appearance (cup-to-disc ratio, presence of optic nerve pallor), visual field data (mean and pattern standard deviations), results of neuro-imaging (if performed), and final diagnosis. Exclusion criteria were as follows: (1) mixed or unclear diagnosis, (2) spherical equivalent > ±5 diopters, (3) poor OCT quality, defined by signal strength <5 or poor alignment on the individual OCT scans, (4) unreliable HVF testing (false positive or false negative >30%), (5) retinal pathology (i.e. diabetic retinopathy, cystoid macular edema, central retinal vein occlusion, or history of retinal laser treatment). All patients underwent imaging by Stratus® OCT (Carl Zeiss Meditec, Inc, Dublin, CA) in both eyes, with results analyzed using software version 3.0. Three OCT scan protocols were performed on both eyes of each patient: 1. fast macular map, 2. fast RNFL 3.4 thickness, and 3. fast optic disc. The fast macular thickness map protocol consists of 6 radial scans centered on the fovea; each scan is composed of 128 single A-scans. The fast macular map reports average macular thickness (µm) and macular volume (MV in mm³), and is composed of three concentric circles of 1 mm, 3 mm, and 6 mm diameter divided into inner and outer rings for a total of nine different measured areas (Fig. 1). The fast RNFL 3.4 mm thickness scan consists of 256 individual A-scans around the circumference of a circle 3.46 mm in diameter centered on the optic nerve. The OCT machine scans this area three times and reports the average RFNL thickness values (µm) of these three scans in 12 clock hours and 4 quadrants, as well as an average RNFL thickness for the entire circumference. The fast optic disc protocol consists of six 4-mm radial linear scans in 1.92 seconds, yielding a topographic map of the optic nerve head and cup. Data reported by the machine includes: optic disc area, cup area, rim area, and cup-to-disc area ratio value overall and for the horizontal and vertical axes. Alignment to the optic nerve disc border was manually adjusted when necessary. Optical coherence tomography macular map display, right eye. 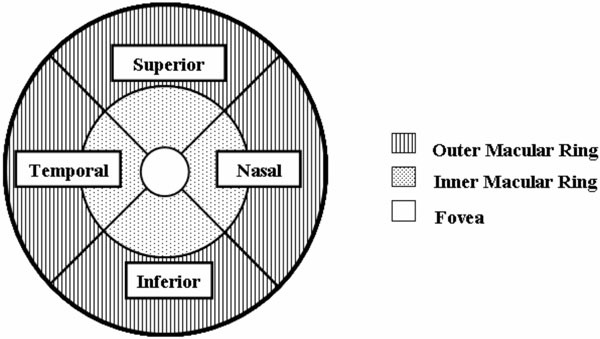 The macular map is divided into outer and inner rings, as well as four quadrants: superior, nasal, inferior, and temporal. The data was analyzed using Microsoft Excel spreadsheets as well as JMP 7.0 (SAS Institute, Cary, North Carolina, USA). Only one eye was included in the data analysis from each patient. In unilateral cases, the affected eye was chosen and in bilaterally affected cases, the worse eye was chosen. Average and mean deviation were calculated for each variable in each group. In the case of visual acuity, Snellen acuity was converted to LogMar to determine the mean, which was then reported back as Snellen acuity. In our primary analysis we chose to match study eyes in each group by optic nerve cup-to-disc area ratio, calculated by OCT (within 0.1), since optic nerve cupping was the clinical parameter of primary interest in this study. To match by cup-to-disc-area ratio subjects 3, 4, 5, and 8 from the glaucoma group, and subjects 2, 5 and 9 from the non-glaucomatous cupping group were excluded for failure to have a suitable cup-to-disc area match (n=8 in each group). A Wilcoxon rank test was performed to compare the various OCT and visual field data values among the two groups. In our secondary analysis, we chose to match study eyes by OCT measurement of average RNFL (within 10 µm), allowing comparison between groups of OCT measured macular volume and thickness, as well as optic nerve morphology (n=11 in each group). In this analysis, subject 11 from the glaucoma group was excluded for failure to have a suitable average RNFL thickness match. A Wilcoxon rank test was performed to compare the various OCT and visual field data between the two groups for each OCT scan type. P-values were calculated and Bonferroni adjusted when appropriate. The average age was significantly lower in patients with non-glaucomatous cupping (43 ± 19.8 years) compared to patients with glaucomatous cupping (67.8 ± 12.5 years, p<0.05). Of those with glaucoma, there were 8 subjects with primary open angle and 4 with normal tension glaucoma (Table 2). In those with non-glaucomatous optic neuropathy, there were 6 with optic neuritis, 1 with congenital optic atrophy, 3 with NA-AION, and 1 with shock optic neuropathy (Table 1). Data in table represent values for eye included in data analysis, unless otherwise noted. NA-AION = Non arteritic anterior ischemic optic neuropathy; BCVA = Best corrected visual acuity; VF MD = Visual field mean deviation; PSD = Pattern standard deviation; SD = Standard deviation. § Cup-to-disc ratio as determined by clinical examination. BCVA = Best corrected visual acuity; VF MD = Visual field mean deviation; PSD = Pattern standard deviation; SD = Standard deviation. § Cup:Disc ratio as determined by clinical examination. For a similar cup-to-disc area ratio as determined by the OCT, eyes with non-glaucomatous cupping had a lower mean RNFL thickness in the nasal quadrant when compared to eyes with glaucomatous cupping (42 ± 6 vs. 57 ± 14 µm, p=0.047) (Table 3). Similarly, eyes with non-glaucomatous cupping had a lower average macular thickness in the superior, nasal, and inferior outer macular ring, compared to eyes with glaucomatous optic nerve cupping. Additionally, subjects with non-glaucomatous optic nerve cupping had lower macular volume compared to those with glaucoma (5.88 ± 0.4 vs. 6.41 ± 0.4 mm3, p=0.027) (Table 4). Rim area, vertical and horizontal cup-to-disc area ratios, as well as visual field parameters were not statistically different between the two groups (Table 5). all p values were Bonferroni adjusted. RNFL= retinal nerve fiber layer. For a similar average RNFL, eyes with non-glaucomatous optic nerve cupping had a lower mean RNFL in both the nasal and temporal quadrants when compared to eyes with glaucomatous optic nerve cupping (nasal RNFL: 47 ± 12 vs. 57 ± 11 µm , p=0.049; temporal RNFL: 41 ± 13 vs. 57 ± 11 µm, p=0.0198) (Table 3). Average macular thickness was significantly lower in eyes with non-glaucomatous optic nerve cupping compared to eyes with glaucomatous optic nerve cupping in 5 out of 8 quadrants tested (Table 4). Additionally, eyes with non-glaucomatous optic nerve cupping had a lower macular volume, (5.89 ± 0.4 vs. 6.31 ± 0.3 mm³, p=0.0068) (Table 4). In the optic nerve topography maps, eyes with glaucomatous optic nerve cupping had decreased rim area compared to eyes with non-glaucomatous optic nerve cupping (0.65 ± 0.24 vs. 1.10 ± 0.56 mm², p=0.0488) (Table 5). Finally, eyes with glaucomatous optic nerve cupping had worse HVF pattern standard deviation (PSD) compared to eyes with non-glaucomatous cupping (9.8 ± 4.3 vs. 6.6 ± 5.4 dB, p=0.0415). HVF mean deviation for eyes with glaucomatous optic nerve cupping compared to those with non-glaucomatous cupping (-12.2 vs. -9.4 dB, p=0.29) was not significantly different between the two groups. Cupping of the optic nerve head is a classic sign of glaucoma, however non-glaucomatous optic neuropathies can cause contour changes of the optic nerve head (ONH) as well. For example, Sebag et al. described contour changes of the ONH (backward bowing of the lamina cribrosa) with A-AION, and Fournier et al. reported contour changes of the ONH associated with dominant optic atrophy. Currently, information from perimetry, ONH pallor, color vision, and visual acuity are used to aid in differentiating glaucomatous from non-glaucomatous optic nerve cupping. There still remain clinical situations in which non-glaucomatous cupping cannot be reliably excluded without neuro-imaging and blood tests indicating a need for further methods to assist in the clinical evaluation of such patients. To our knowledge, this is the first study to apply OCT imaging as a means to compare non-glaucomatous and glaucomatous optic nerve cupping. We identified non-glaucomatous cupping of the optic nerve clinically and examined the cup morphology using the Stratus® OCT fast optic disc scan. When we compared patients with similar cup-to-disc ratios (by OCT measurement), or with similar average RNFL thickness, we found that those with non-glaucomatous optic nerve cupping had lower macular thickness and macular volume compared to those with glaucomatous optic nerve cupping (Table 4). We also found that the nasal and temporal RNFL thickness were lower in patients with non-glaucomatous optic nerve cupping compared to those with glaucomatous cupping. Our OCT results suggest that the RNFL loss in non-glaucomatous optic nerve cupping is not typically in the superior and inferior quadrants, as reported in glaucoma. Based on histopathologic studies performed by Quigley et al. the pattern of RNFL loss in glaucoma tends to be greater in the superior and inferior quadrants, while that of non-glaucomatous optic neuropathy was more varied depending upon the etiology . The same pattern of RNFL loss in glaucoma has also been documented in analysis of red-free fundus photographs [36,37], and in prior OCT studies. [26, 38-42] It is this pattern of loss that accounts for the typical visual field defect pattern observed in glaucoma. Lu et al. recently showed that the best parameters to detect glaucoma using OCT are a below normal inferior quadrant, superior quadrant, or overall mean RNFL thickness. The findings from our study suggest that overall mean RNFL loss occurs in optic nerve damage of any cause and is not necessarily specific for glaucoma (Table 3). Macular volume and macular thickness measurements by OCT have been shown to be less sensitive than average RNFL in the detection of glaucoma [24, 25]. In our study, we showed that for a similar average RNFL thickness, the macular volume was reduced significantly in patients with non-glaucomatous cupping compared to patients with glaucomatous cupping (Table 4). The findings of reduced macular thickness and volume in our patients with non-glaucomatous cupping may be explained by Wallerian degeneration . With disruption of axonal integrity, degeneration of the proximal axon segment occurs. Specifically, some lesions of the posterior optic nerve, such as a compressive mass lesion, have been reported to result in preferential damage to the smaller diameter macular axonal fibers traveling within the optic nerve . There may be preferential damage to the papillomacular bundle in non-glaucomatous optic neuropathies which could theoretically cause reduced macular thickness and volume. Another interesting finding from our study was the significant difference in visual function between the groups (Table 1 and 2). Patients with non-glaucomatous optic nerve cupping had better visual field MD and PSD compared to patients with glaucomatous optic nerve cupping. HVF testing may not accurately reflect visual function. DeLeón-Ortega et al. correlated RNFL with visual field in patients with NA-AION, and found that RNFL loss extends beyond the region corresponding to the VF defect. Similarly, Noval et al. showed that in patients with optic neuritis, OCT detected axonal loss before the presence of a visual field defect, and also correlated the degree of mean RNFL thinning with visual acuity. Fisher et al. performed OCT in patients with multiple sclerosis with and without optic neuritis, and showed that RNFL thickness can be correlated to contrast sensitivity and low-contrast letter acuity scores. We acknowledge several limitations of our study. We chose to match patients primarily by cup-to-disc area ratio as determined by OCT. Arnalich-Montiel et al. showed that when compared to clinical observation, OCT tends to overestimate cup-to-disc ratio values, notable in optic nerves with small cup-to-disc ratios. This could have potentially introduced bias into our study however, it would be nullified presumably because a similar error would occur in both groups as the average cup-to-disc area ratio was not significantly different in each group. Another point to note is the significant age difference between the two groups. It is known that RNFL thickness decreases with age . In our cohort, the age of the patients was significantly lower in those with non-glaucomatous optic nerve cupping, which was also the group with lower RNFL thickness in the nasal and temporal quadrants, suggesting that age variance was not likely accounting for these findings. Lastly, due to our small sample size, patients were grouped under the broad diagnosis umbrella of non-glaucomatous optic nerve cupping. Stratification and subanalysis by neurologic diagnosis was not possible because it was not feasible to obtain a large number of patients with only a single neuro-ophthalmic cause of non-glaucomatous optic nerve cupping. The pattern of RNFL loss is variable depending upon the type of non-glaucomatous optic neuropathy  and in the future it would be more precise to study the pattern of RNFL loss in each disease entity independently. One could consider our pilot study as a “real world” clinical situation. While it would seem likely that the subspecialty trained neuro-ophthalmologist or glaucoma specialist would be able to differentiate the broad etiology of a cupped optic nerve by morphology, this question is one that frequently faces each of the subspecialists in clinical practice. During the initial clinical evaluation of such a diagnostic dilemma the clinician is not aware of the etiology of the optic nerve cupping (glaucomatous vs non-glaucomatous) and must decide on whether further extensive investigation is needed, and that is what this study attempted to determine. The role of neuro-imaging to evaluate the cause of non-glaucomatous optic nerve cupping has been discussed in the literature . Visual field testing is valuable in these cases; however, due to its subjective nature it can be highly variable or even unreliable. The strategy of obtaining neuro-imaging in all patients with “suspicious” optic nerve cupping is not cost effective. Therefore, OCT may serve as a fast and economical test to aid in determining whether a patient may have non-glaucomatous cupping requiring neuro-imaging and further testing. Based on the results of this pilot study, OCT may have the potential to complement clinical decision-making when there is a question of glaucomatous versus non-glaucomatous optic nerve cupping; specifically when visual field testing and clinical examination (the presence of optic nerve pallor) are not definitive, or in the setting of progressive cupping despite adequate intraocular pressure control. Quigley HA. Early detection of glaucomatous damage. II. Changes in the appearance of the optic disk Surv Ophthalmol 1985; 30(2): 111-7. Quigley HA, Addicks EM, Green WR, Maumenee AE. Optic nerve damage in human glaucoma. II. The site of injury and susceptibility to damage Arch Ophthalmol 1981; 99(4): 635-49. Quigley HA, Green WR. The histology of human glaucoma cupping and nerve damage Ophthalmology 1979; 10: 1803-30. Hayreh SS. Pathogenesis of cupping of the optic disc Br J Ophthalmol 1974; 58(10): 863. Danesh-Meyer HV, Savino PJ, Sergott RC. The prevalence of cupping in end-stage arteritic and nonarteritic anterior ischemic optic neuropathy Ophthalmology 2001; 108(3): 593-8. Hayreh SS, Jonas JB. Optic disc morphology after arteritic anterior ischemic optic neuropathy Ophthalmology 2001; 108(9): 1586-94. McLeod D. Optic disc morphology after AAION Ophthalmology 2002; 109(7): 1201-2. Sebag J, Thomas JV, Epstein DL, Grant WM. Optic disc cupping in arteritic anterior ischemic optic neuropathy resembles glaucomatous cupping Ophthalmology 1986; 93(3): 357-61. Volpe NJ. The prevalence of cupping in end-stage arteritic and nonarteritic anterior ischemic optic neuropathy Evidence-Based Ophthalmology 2001; 2(4): 204-0. Sonty S, Schwartz B. Development of cupping and pallor in posterior ischemic optic neuropathy Int Ophthalmol 1983; 6(3): 213-20. Blumenthal EZ, Girkin CA, Dotan S. Glaucomatous-like cupping associated with slow-growing supra-sellar intracranial lesions Neuro-Ophthalmology 2006; 30(5): 111-5. Bianchi-Marzoli S, Rizzo Iii JF, Brancato R, Lessell S. Quantitative analysis of optic disc cupping in compressive optic neuropathy J Neuroophthalmology 1996; 16(1): 56. Rebolleda G, Noval S, Contreras I, et al. Optic disc cupping after optic neuritis evaluated with optic coherence tomography Eye 2008; 23: 890-4. Fournier AV, Damji KF, Epstein DL, Pollock SC. Disc excavation in dominant optic atrophy Differentiation from normal tension glaucoma Ophthalmology 2001; 108(9): 1595-602. Piette SD, Sergott RC. Pathological optic-disc cupping Curr Opin Ophthalmol 2006; 17(1): 1. Sekkat A, Maillard P, Dupeyron G, et al. Optic neuropathy in acute poisoning with methanol J Fr Ophtalmol 1982; 5(12): 797-804. Drance SM, Morgan RW, Sweeney VP. Shock-induced optic neuropathy: a cause of nonprogressive glaucoma N Engl J Med 1973; 288(8): 392-5. Rupp-Montpetit K, Moody ML. Visual loss as a complication of nonophthalmologic surgery: a review of the literature AANA J 2004; 72(4): 285-92. Ortiz RG, Newman NJ, Manoukian SV, et al. Optic disk cupping and electrocardiographic abnormalities in an American pedigree with Leber's hereditary optic neuropathy Am J Ophthalmol 1992; 113(5): 561-6. Trobe JD, Glaser JS, Cassady J, et al. Nonglaucomatous excavation of the optic disc Arch Ophthalmol 1980; 98(6): 1046-50. Trobe JD, Glaser JS, Cassady JC. Optic atrophy. Differential diagnosis by fundus observation alone Arch Ophthalmol 1980; 98(6): 1040-5. Kanamori A, Nakamura M, Escano MFT, et al. Evaluation of the glaucomatous damage on retinal nerve fiber layer thickness measured by optical coherence tomography Am J Ophthalmol 2003; 135(4): 513-20. Sihota R, Sony P, Gupta V, et al. Diagnostic capability of optical coherence tomography in evaluating the degree of glaucomatous retinal nerve fiber damage Invest Ophthalmol Vis Sci 2006; 47(5): 2006-10. Leung CKS, Chan WM, Yung WH, et al. Comparison of macular and peripapillary measurements for the detection of glaucoma An Optical Coherence Tomography study Ophthalmology 2005; 112(3): 391-400. Wollstein G, Ishikawa H, Wang J, et al. Comparison of three optical coherence tomography scanning areas for detection of glaucomatous damage Am J Ophthalmol 2005; 139(1): 39-43. Budenz DL, Michael A, Chang RT, et al. Sensitivity and specificity of the StratusOCT for perimetric glaucoma Ophthalmology 2005; 112(1): 3-9. Budenz DL, Fredette MJ, Feuer WJ, Anderson DR. Reproducibility of peripapillary retinal nerve fiber thickness meas-urements with stratus OCT in glaucomatous eyes Ophthalmology 2008; 115(4): 661-. Monteiro MLR, Moura FC, Medeiros FA. Diagnostic ability of optical coherence tomography with a normative database to detect band atrophy of the optic nerve Am J Ophthalmol 2007; 143(5): 896-9. Kanamori A, Nakamura M, Matsui N, et al. Optical coherence tomography detects characteristic retinal nerve fiber layer thickness corresponding to band atrophy of the optic discs Ophthalmology 2004; 111(12): 2278-83. Medeiros FA, Moura FC, Vessani RM, Susanna R. Axonal loss after traumatic optic neuropathy documented by optical coherence tomography Am J Ophthalmol 2003; 135(3): 406-8. Fisher JB, Jacobs DA, Markowitz CE, et al. Relation of visual function to retinal nerve fiber layer thickness in multiple sclerosis Ophthalmology 2006; 113(2): 324-32. Trip SA, Schlottmann PG, Jones SJ, et al. Retinal nerve fiber layer axonal loss and visual dysfunction in optic neuritis Ann Neurol 2005; 58(3): 383. DeLeón-Ortega J, Carroll KE, Arthur SN, Girkin CA. Correlations between retinal nerve fiber layer and visual field in eyes with non-arteritic anterior ischemic optic neuropathy Am J Ophthalmol 2007; 143(2): 288-94. Contreras I, Noval S, Rebolleda G, Munoz-Negrete FJ. Follow-up of nonarteritic anterior ischemic optic neuropathy with optical coherence tomography Ophthalmology 2007; 114(12): 2338-44. Noval S, Contreras I, Rebolleda G, Munoz-Negrete FJ. Optical coherence tomography versus automated perimetry for follow-up of optic neuritis Acta Opthalmol Scand 2006; 84(6): 790. Jonas JB, Nguyen NX, Strahwald H, Naumann GO. [The retinal nerve fiber layer in normal eyes and in glaucoma. I. Semiquantitative data of 398 eyes with glaucoma] Klin Monbl Augenheilkd 1989; 194(6): 437-46. Jonas JB, Schiro D. Localised wedge shaped defects of the retinal nerve fibre layer in glaucoma Br J Ophthalmol 1994; 78(4): 285-90. Fang AW, Qu J, Li LP, Ji BL. Measurement of retinal nerve fiber layer in primary acute angle closure glaucoma by optical coherence tomography J Glaucoma 2007; 16(2): 178-84. Gyatsho J, Kaushik S, Gupta A, et al. Retinal nerve fiber layer thickness in normal, ocular hypertensive, and glaucomatous Indian eyes: an optical coherence tomography study J Glaucoma 2008; 17(2): 122-7. Hood DC, Harizman N, Kanadani FN, et al. Retinal nerve fibre thickness measured with optical coherence tomography accurately detects confirmed glaucomatous damage Br J Ophthalmol 2007; 91(7): 905-7. Kanamori A, Nakamura M, Escano MF, et al. Evaluation of the glaucomatous damage on retinal nerve fiber layer thickness measured by optical coherence tomography Am J Ophthalmol 2003; 135(4): 513-20. Medeiros FA, Zangwill LM, Bowd C, et al. Evaluation of retinal nerve fiber layer, optic nerve head, and macular thickness measurements for glaucoma detection using optical coherence tomography Am J Ophthalmol 2005; 139(1): 44-55. Lu A, Wang M, Varma R, et al. and Advanced Imaging for Glaucoma Study Group. combining nerve fiber layer parameters to optimize glaucoma diagnosis with optical coherence tomography Ophthalmology 2008; 115(8): 1352-7. Hart Jr WM. Adler's physiology of the eye: clinical application. St. Louis: Mosby 1992. Arnalich-Montiel F, Muñoz-Negrete FJ, Rebolleda G, et al. Cup-to-disc ratio: agreement between slit-lamp indirect ophthalmoscopic estimation and stratus optical coherence tomography measurement Eye 2007; 21: 1041-9. Parikh RS, Parikh SR, Sekhar GC, et al. Normal age-related decay of retinal nerve fiber layer thickness Ophthalmology 2007; 114(5): 921-6. Quigley HA, Addicks EM, Green WR. Optic nerve damage in human glaucoma. III. Quantitative correlation of nerve fiber loss and visual field defect in glaucoma, ischemic neuropathy, papilledema, and toxic neuropathy Arch Ophthalmol 1982; 100(1): 135-46. Greenfield DS, Siatkowski RM, Glaser JS. The cupped disc. Who needs neuroimaging? Ophthalmology 1998; 105(10): 1866-74.